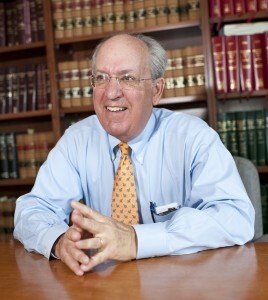 Matthew Feinberg is a seasoned trial and appellate lawyer with over 40 years of experience. He specializes in criminal defense, contested divorce litigation, bar discipline, mediation and civil litigation. He has tried nearly 100 cases to juries, both in state and federal court. His matrimonial work includes complex, high net worth cases usually involving business valuation of partnerships, closed corporations and the like. He also has a considerable appellate practice in these areas. After graduating from Tufts University in 1964, Mr. Feinberg attended Boston University School of Law. He received his LL.B degree in 1967. Mr. Feinberg is admitted to the United States District Court for the District of Massachusetts, the United States Court of Appeals for the 1st Circuit and the United States Supreme Court, where he has argued on three occasions. His dedication to ethics and his superior legal skills have earned him the highest rank of AV-Preeminent* from Martindale-Hubbell. He is a member of the Massachusetts Bar Association, the American Bar Association, the National Association of Criminal Defense Lawyers and the Massachusetts Association of Criminal Defense Lawyers. In addition, he is a fellow of the American Academy of Matrimonial Lawyers, and previously served on its Board of Managers. Mr. Feinberg sat on the Massachusetts Special Commission on Violence Against Children. He was the legal director for the Massachusetts Chapter of the American Civil Liberties Union and was a member of its Board of Directors. Mr. Feinberg has also served as an adjunct professor of constitutional law and criminal procedure, and has been a guest lecturer at Harvard Law School. * AV-Preeminent and BV-Distinguished are certification marks of Reed Elsevier Properties Inc., used in accordance with the Martindale-Hubbell certification procedures, standards and policies. Martindale-Hubbell is the facilitator of a peer review rating process. Ratings reflect the confidential opinions of members of the Bar and the judiciary. Martindale-Hubbell ratings fall into two categories - legal ability and general ethical standards.